What happens when a mother divorces her abusive husband? 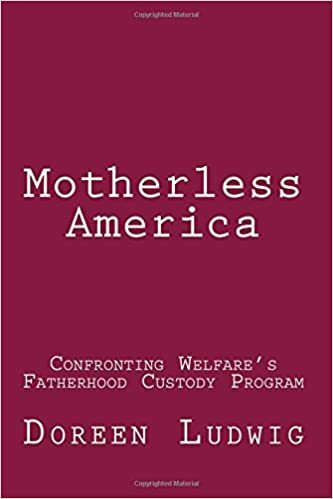 “Motherless America: Confronting Welfare’s Fatherhood Custody Program” six memoir chapters answer the question in a raw tale of corruption and cover-up. Three protagonists, a lawyer, a psychologist and a judge, collude to eliminate mother from the children’s lives by calling her mentally ill, jailing, depriving her of financial resources and the ability to educate and improve herself. Under dire circumstances, Doreen plows forward, learns the law, only to discover and investigate the government program that funds father’s abuse. Six memoir chapters humanize by using real life to demonstrate problems, showing how policy affects lives. It is not common knowledge that our government finances a family court industry that mandates abusive fathers over protecting women and children. Motherless America shines a light on a government program designed to give fathers control of children by way of family court. Six memoir chapters with four research chapters that inform readers of the nature of abuse and how it is processed by the family court industry; who invented the government program to make sure men control the family even after divorce; occupations that administer the program; and government funding and program design. The book concludes with a chapter that lists problems and offers solutions.